Israel's Prime Minister Benjamin Netanyahu arriving in Liberia. Photo Credit: Israel PM Office. Israel courts African nations with Muslim minority populations to overcome a longstanding bloc of opposition at the United Nations. An Israeli campaign is underway in sub-Saharan Africa on winning over African nations, which, partly due to significant Muslim minority populations, have often constituted a bloc of opposition at the UN. In June 2017, Israeli Prime Minister Benjamin Netanyahu was the first non-African leader to participate in a Summit of the Economic Community of West African States, or ECOWAS. The following November, he attended Kenyan President Uhuru Kenyatta’s swearing-in ceremony in Nairobi, joining leaders from other African countries and holding several bilateral meetings. In 2016, Netanyahu had already become the first Israeli prime minister in three decades to travel to Africa, visiting Uganda, Kenya, Rwanda and Ethiopia. According to Atlantic Council expert J. Peter Pham, such encounters “represent a remarkable testament to how much of a priority the Israeli government has made of Africa.” In April of this year, Netanyahu announced a deal with the UN refugee agency to resettle African asylum seekers, keeping 16,000 in Israel and sending 16,000 to Western countries. The next day, under political pressure in Israel, he suspended the deal, outraging Israeli human rights activists. While the suspension holds for now, the prime minister emphasized that it would be reexamined. With growing investments in East and West African countries, Israel is becoming a key player on the continent. Israel’s expansion in Africa, like that of China, India and Turkey, is facilitated by relative pullback by the United States and France. The involvement focuses on geostrategic and security interests, particularly forming allies to support Israel in international bodies and fight against jihadist movements to gaining new trade partners and access to markets. So far, the strategy is working as African countries embrace this role. Historically, Afro-Israeli relations have fluctuated. In the 1960s, Israel provided assistance to newly independent African states in varied fields, ranging from agriculture and medicine to defense and infrastructure construction. More than 30 Israeli diplomatic missions operated in Africa until the 1973 Yom Kippur War between Israel and the Arab coalition led by Egypt and Syria. In the war’s wake, the Organization of African Unity instructed its members to cease diplomatic ties with Israel. All except Malawi, Lesotho and Swaziland did so. Israeli-African collaboration continued in some fields, including agriculture and development. Israel, fearing opposition forces in states such as Chad, Togo and the former Zaire, also ensured military support to mainly authoritarian regimes. Most African countries resumed diplomatic relations with Israel in the 1990s. Israel currently has ties with 40 out of the 48 sub-Saharan African countries, yet only 10, including Kenya and Senegal, have embassies. Israel is now pushing to regain observer status in the African Union, after losing this role when the Organization of African Union was replaced by the AU. Israel’s diplomatic rapprochement may be reaping fruits. In 2015, Israel resisted an International Atomic Energy Agency resolution demanding it open its undeclared nuclear facilities to UN inspectors, partly because several African states abstained or voted against it. Even on issues as tense as the Israeli-Palestinian conflict, some progress can be seen. In December, the UN General Assembly overwhelmingly rejected a resolution recognizing Jerusalem’s status as Israel’s capital, and Pham suggests it was a small victory for Israel that only 27 of the 44 members of the Africa Group who are not also members of the Arab League voted in favor. For years, African states had mostly supported Palestinian self-determination, not surprising given that sub-Saharan Africa is home to a considerable Muslim population. 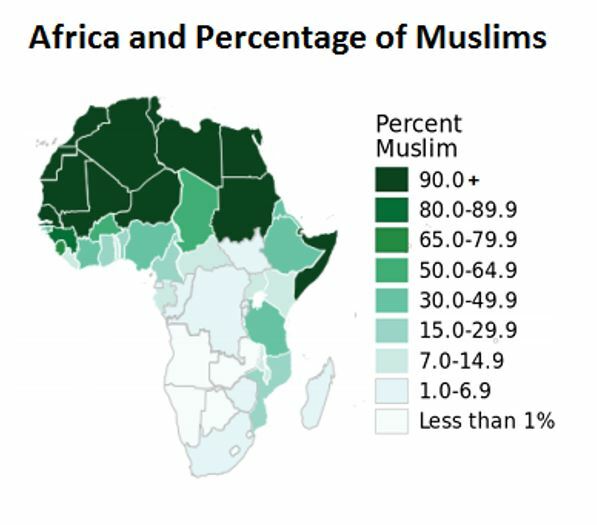 According to the Pew Research Center, in 2010, around 30 percent of sub-Saharan Africans were Muslims. The sub-region West Africa has a Muslim majority, just over half the population, and East Africa has 30 percent. Sub-Saharan Africa’s population is expected to more than double by 2050 with the Muslim population reaching 35 percent. The implication for Israel is that the Palestinian cause could gain more support in Africa. Olusola Isola, a Woodrow Wilson Center scholar, suggests that Israel direct efforts at carving “African countries’ understanding on the position of Israel vis-à-vis the Palestinian question and in the context of the Middle East conflict and [….] market itself more on the diplomatic sphere.” The goal: Gradually sway countries with smaller Muslim populations to support Israel or, at a minimum, avoid antagonism and intense opposition to Israeli policies. Six of the 10 fastest growing economies in the world are in Africa with Ethiopia in the lead, and trade is another central reason for Israel’s interest. Africa, despite present-day challenges, is still very much the continent of the future. Pham emphasizes that “there are considerable stakes for an economy such as Israel’s to be able to tap the dynamic region.” Africa is also the youngest continent, and Pham points out that by mid-century, one in four workers in the world will be African. With only $1 billion in annual Israeli-African trade value, Israel has barely started exploring this market. Almost two thirds of current trade takes place with South Africa, mostly for diamonds. African states seek access to sophisticated technology in a multiple domains including military applications, surveillance, irrigation, water management and solar energy. African states also hope to diversify arms and military technology suppliers to become less dependent on the United States and Europe. During ECOWAS, Netanyahu announced an investment of $1 billion in solar energy to benefit the 15 member countries over the next four years with implementation by Energiya Global, Israel’s leading solar developer. The first project: a $20 million solar field at Roberts International Airport in Liberia, estimated to supply 25 percent of the country’s power. In December, Israel signed an agreement with the United States to increase Africa’s energy access and electricity deficiencies through innovative solutions. The partnership is part of a $7 billion, five-year Power Africa project, launched by the Obama administration. For the most part, Israel’s rapprochement focuses on many of the same areas as during the 1960s and 1970s: military support and raw goods like diamonds. Israel still conceptualizes development, security and economic assistance as exchangeable for votes in international organizations, punishing any non-compliance. In early 2017, following a UN Security Council vote condemning Israeli settlements as illegal, Israel cut aid to Senegal for supporting the resolution. Despite policy sophistication, Israel does not seem ready to quit the traditional carrot-and-stick approach. It may find that long-term connections of mutual interest are more productive. *Raluca Besliu is a freelance journalist focused on women’s and children’s rights, refugee and human rights issues, and peace and post-conflict reconstruction. She graduated from the University of Oxford with an Msc in Refugees and Forced Migration after studying international affairs at Vassar College. She founded the nonprofit organization Save South Kordofan. Follow her on Twitter.